Today is September 21, 2016. Two of the largest central banks in the world gave press releases after their regularly scheduled two day meetings. It is not normal for two major central banks to do this on the same day, but this is what took place today. The reason I am calling it a “holiday” is because the most common theme across investment markets at the management or trading level has become “central banks run the show”. Free markets? What’s that? We now are centrally planned with constant intervention by the state (i.e. major central banks) to make certain the public is happy with their 401k statements and rising real estate prices. Will this grand illusion end very badly and powerfully? Could it be very soon? Have we reached a place in history where more central planning, greater the debt levels, and more “assisted” markets become week by week, the MORE confident we can become that this is a much better path than when we had a more free market structure, far less debt, and “assistance” was occasional rather than constant? Once again, the computer algos with some “assistance” kicked off another hard run back up. Will it last long? Go to a new all time high again? What is important is that we all remember that the image of central bankers bring happiness was issued on this new “holiday”. Of course, all is not rosy for central bankers. 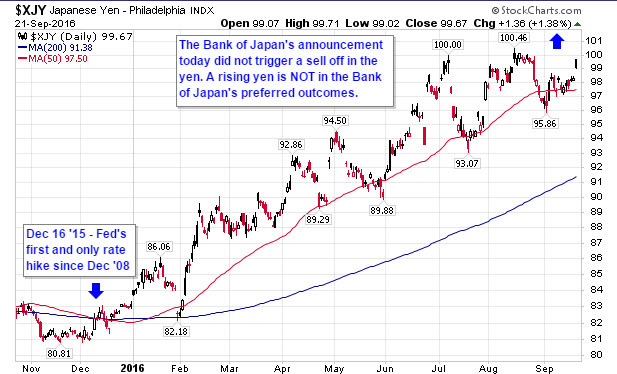 The Bank of Japan continues having troubles getting the yen to go down according to their plans, and their stock market to climb much before stalling. 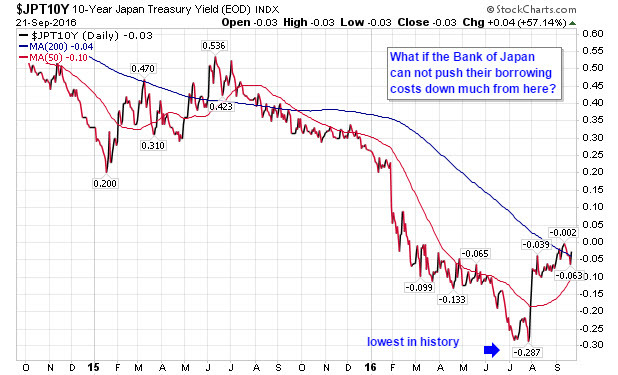 Now yields on its debt have been climbing from their lowest levels in history. As you look at the chart of the NASDAQ 100 above, ask yourself, “Are stocks reflecting the comments and data that brought us into this “holiday”? 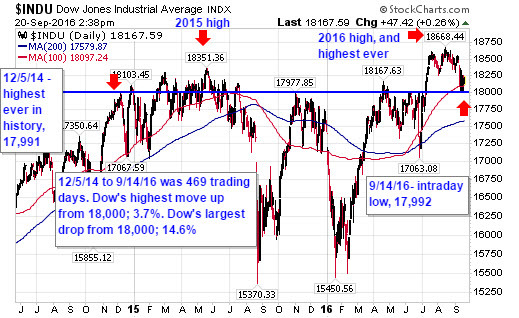 Do financial markets at all time high levels reflect the REAL economy? If not, should every investor have an exit plan? 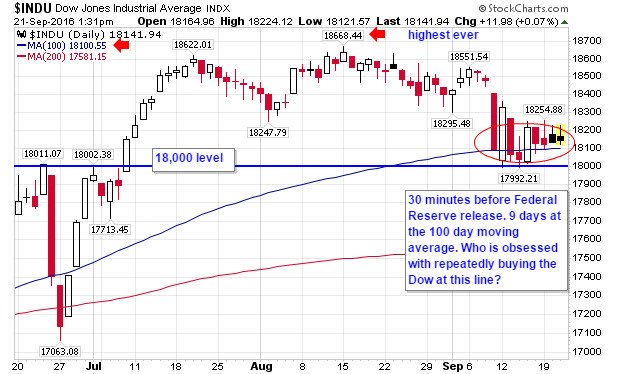 Most of the comments and charts below were pulled today, Sept 21st. 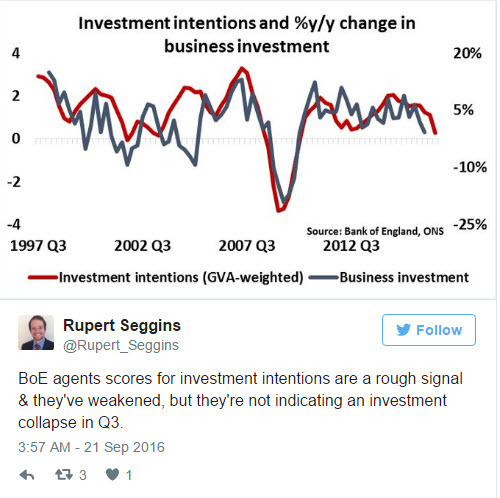 The first two tweets are by Lawrence Summers, former US Treasury Secretary and Chief Economist at the World Bank. I thought these bankers “always” had another scheme to fix the problem? With the NASDAQ producing its highest levels ever today, it would appear that “the crowd” is certainly not thinking about a “shock at a fragile moment”. This NASDAQ image is of extreme confidence. On this “holiday”, are there any “gloom and doom” naysayers who just can’t understand all the optimism central bankers have brought stock investors? 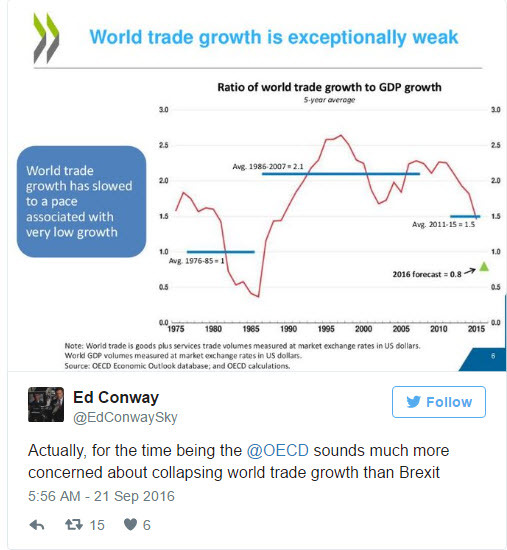 But what does world trade have to do with a stock market? If business investment has been slowing, why should that possibly impact our 401k statements and retirement plans? 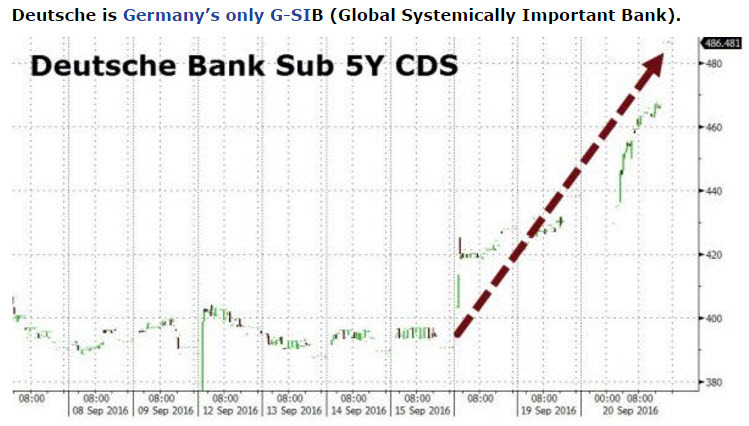 Yes, I know there are things called Credit Default Swaps which rise in price sharply if these big investors believe a company or country is on the verge of default, but why worry that one of the largest banks in Europe could be on the verge of default or nationalization by the German government? Besides, that only happens in times like September 2008 when Lehman’s filed bankruptcy and AIG was nationalized and stocks were getting clobbered. 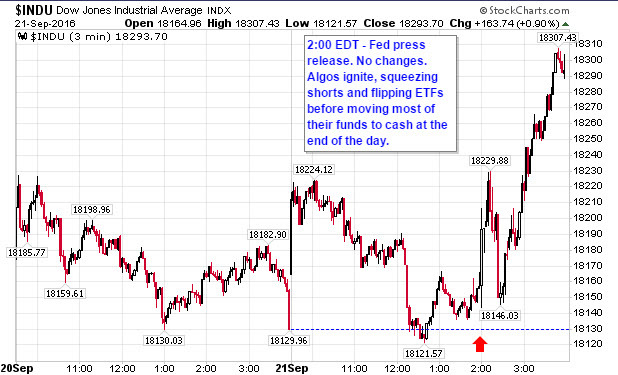 Stocks certainly don’t seemed phased by such news today. As we can see, central bankers have made sure at that millions of stocks investors sitting in stock funds at all time high levels will not impacted by something that happens in Europe…right? 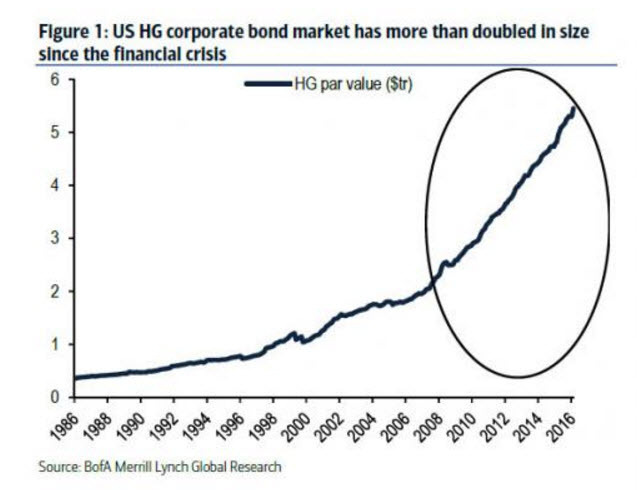 The doubling of corporate debt since 2008? That doesn’t look good? What if corporate stock prices start falling, wouldn’t the company still have all this debt on its books? 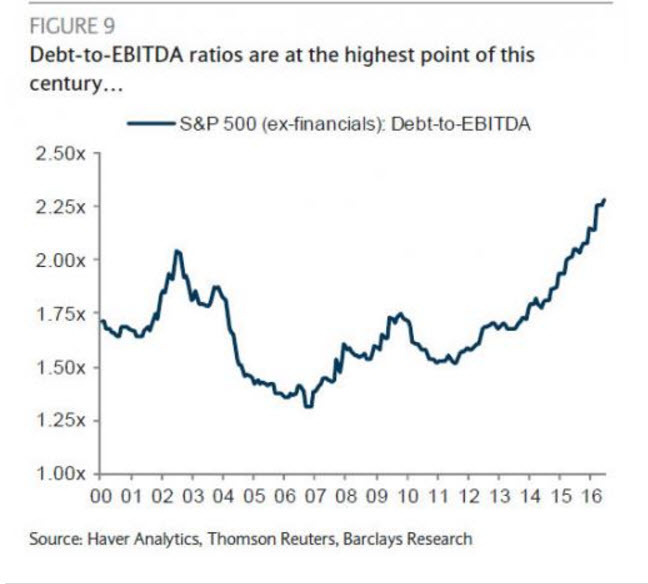 If debt were climbing faster than earnings and had reached the highest levels since 2000 this seems like something that would impact all time high stock prices, doesn’t it? Well, I am not going to worry or be concerned about this silly old data. My experience from trusting central bankers for the last few years has come out okay. The brokerage statement is fine. Besides, what could some manager who oversees a couple hundred billion in investments know that I don’t know? Why do I need to even think about making changes now, especially since today is a central banker’s “holiday”? One things is for certain. Central bankers have been at this a very long time. They know what they are doing. This is certainly no “experiment”, and they would never artificially push up prices to trick us into thinking we were wealthy from trillions in new debt. The six months under review have seen central bankers continuing what is surely the greatest experiment in monetary policy in the history of the world. 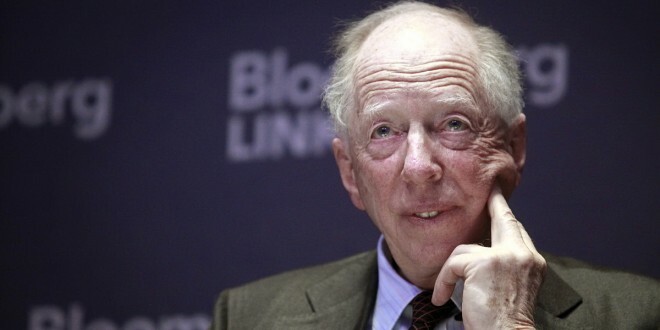 We are therefore in uncharted waters and it is impossible to predict the unintended consequences of very low interest rates, with some 30 percent of global government debt at negative yields, combined with quantitative easing on a massive scale,” Rothschild writes in the company’s semi-annual financial report. It also wants to make people feel wealthier – and more willing to spend. 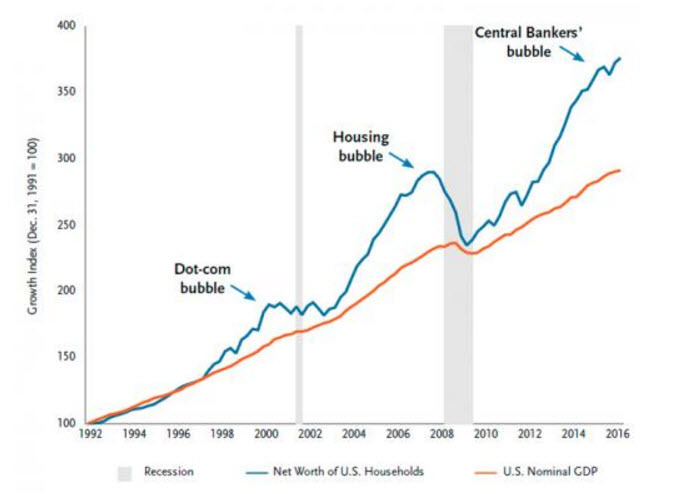 The idea is for the Fed’s $40 billion-a-month in bond purchases to lower interest rates and cause stock and home prices to rise, creating a ‘wealth effect’ that would boost the economy. Thank goodness we can have these holidays in celebration of our central bankers. Why would anyone be foolish enough to think these central planners of our financial markets and global economy would ever face limits in markets? Now I am having doubts? Maybe having an “unlimited punch bowl” is not such a good idea? Maybe I should stop betting with an “all in” approach, never selling or reducing my junk bond and stock positions at these all time high levels? Just not today. It’s a holiday. 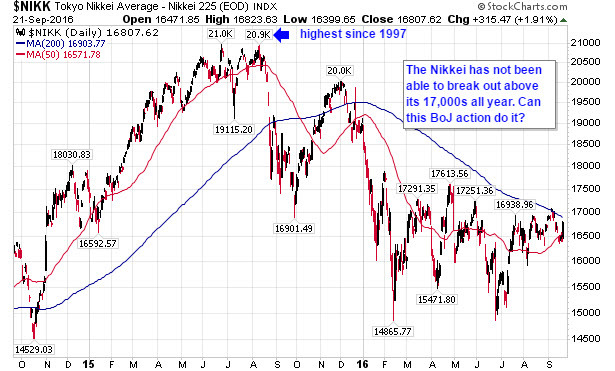 This entry was posted in Uncategorized and tagged 401k, Bernanke, bonds, bubble, central banks, Deutsche Bank, risk, Rothschild, stocks, wealth effect on September 22, 2016 by Doug Wakefield.